I have to confess at the start that I waited for this book with anticipation for quite a few years when I discovered, in a conversation with the author, that it was in preparation. I must also say that its eventual release has more than satisfied my curiosity about the enigmatic musician who surely qualifies as one of the more underrated jazz composers, arrangers, and players of the twentieth century. 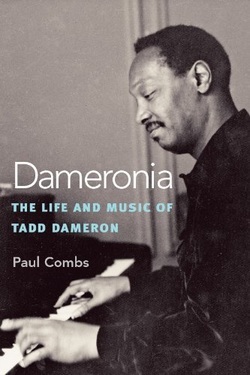 Dameronia is the first authoritative biog­raphy of Tadd Dameron, an important and widely influential figure in jazz history, one of the most significant composers and ar­rangers of jazz, swing, bebop, and big band. He arranged for names like Count Basie, Artie Shaw, Jimmie Lunceford, and Dizzy Gillespie and played with Bull Moose Jackson and Benny Golson. This book sets out to clarify Dameron's place in the development of jazz in the post-World War II era. It also attempts to shed light on the tragedy of his retreat from the center of jazz activity in the 1950s. By tracing Dameron's career, one finds that until 1958, when he was incarcerated for drug related offenses, he was at the forefront of developments in jazz, sometimes antici­pating trends that would not develop fully for several years. Dameron was also an impor­tant influence on several high-profile musi­cians, including Miles Davis, Benny Golson, and Frank Foster. Dameron was a very private man, and while in some aspects of his life he will probably remain an enigma, this book manages to give an intimate portrait of his life at a couple of key stages: the height of his career in 1949 and the brief but produc­tive period between his release from prison and his death. The book is liberally spiced with expertly analyzed musical examples and rare photographs. It presents a chronological narrative of the artists’ development that provides a foundation future historians will be able to build on and fills in some significant gaps in the evolution of bebop. It is refreshing to discover a biography that employs musical references to illustrate significant milestones in the career of such an important contributor to the vocabulary of jazz in the 1940s and ’50s. About the author: Musician and educator Paul Combs received his earliest musical training in voice and trombone and studied saxophone, harmony and counterpoint as a teenager. He graduated with a B.Mus. in composition from the Philadelphia Musical Academy and earned his M.M. in performance at the University of Massachusetts Lowell. His eclectic career has included performing, composing for theater, film, radio and television, and producing and announcing at radio stations in Philadelphia and Boston. From 1986 to 1999 he worked full-time in music education, and was very active in the Mass. Music Educators Association. Currently Mr. Combs is working as a free-lance performer, educator and author. He is a voting member on NARAS (the Grammys), and an executive board member of the Massachusetts Association for Jazz Education. Paul’s “Pocket Big Band,” can be heard Sunday nights at the Chit Chat Club in Haverhill, Massachusetts, featuring original tunes and arrangements (and some charts by Tadd Dameron! ).